Must Married Couples File for Bankruptcy Together? 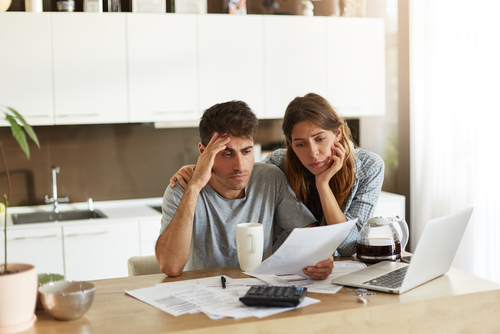 It may be the case that both partners within a marriage are facing financial challenges or it could be the case that one has racked up significant debt on joint accounts that affect both. Married couples do have the option to file bankruptcy together, but they are not obligated to do so. If you are contemplating filing for bankruptcy, you’ll want to sit down directly with an experienced bankruptcy attorney and figure out whether it makes sense for you to file jointly or on your own. For married couples initiating bankruptcy on a joint basis, it will be less expensive than filing on your own because the filing fees are exactly the same whether you go in as a joint file or a single file. Attorneys may also charge less for joint filings than they would for two separate individual filings. All of the property becomes subject to bankruptcy proceedings in these cases. If one spouse is filing on their own, they might want to protect the spouse’s credit or some of their property. If you had property in your name before getting married and the spouse initiates a bankruptcy proceeding, that property does not become part of the bankruptcy estate. Meaning the court and the trustee do not have jurisdiction over the property regardless of the value. All debts are discharged if both parties in the couple file jointly. The personal debts and any debts incurred together are eliminated. When only one spouse files for bankruptcy, however, that spouse is the only one to get a discharge. Meaning that the non-filing spouse will still have to pay any joint debts or any personal debts. As you can see, there are very complicated factors involved in determining whether or not it’s in your best interests to file for bankruptcy on your own, or as a couple. Talking directly with an attorney and walking through the unique aspects of your financial situation including your assets and your liabilities can further clarify what’s truly right for you. Joel R. Spivack is here to help you when you’re facing bankruptcy- call 856-861-6203 or fill out our convenient online contact form to get started today. ← Can Bankruptcy In New Jersey Help Me Get Rid Of Debts From Credit Card Fraud?